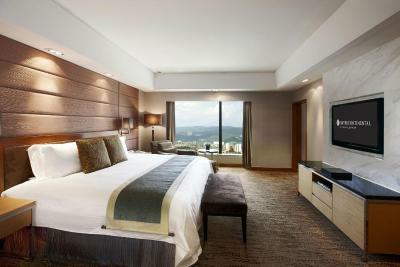 Lock in a great price for InterContinental Kuala Lumpur – rated 8.8 by recent guests! Staff at Club Intercontinental were exceptional. All staff were friendly and amenable. Close to Petronas Towers and Suria KLCC and other shopping malls. Very close to Ampang Park LRT Station - it is across the road. Ampang Park LRT is about 15 minutes from KL Sentral. KL Sentral is 30 minutes from the airport. The Intermark shopping mall is about a 10 minute walk away. Swimming pool needs to have a more visible ‘lifeguard’. Not clear as to how to order food/drinks by the pool. Everything was excellent..special mention to the helpful staffs...thanks everyone.. Friendly Staff was responsive and try to be helpful. The Chef prepared seasoning according to my request for the oysters. Room was clean and spacious, the bed was comfy. Good experience at the hotel in general. Size of the room, staff specially Ms. Valirey she assist me in printing my papers when the printer in the business center was under maintenance. Internal design of the hotel is perfect. Room was big, price was really good, considering the facilities we get. Breakfast was nice with a lot selection. Location was great and really near LRT station. Great place, super breakfast, wonderful hotel staff. The concierge manager Rico Herman and his assistant Badrullah were more than helpful in every way. They went over and above to make sure we move around smoothly and conveniently. A big thumbs up to making our stay even more enjoyable. The gentleman who check in for us is very polite and professional. The room is very clean and tidy. It's not my first time to stay here. InterContinental Kuala Lumpur This rating is a reflection of how the property compares to the industry standard when it comes to price, facilities and services available. It's based on a self-evaluation by the property. Use this rating to help choose your stay! One of our top picks in Kuala Lumpur.InterContinental Kuala Lumpur offers accommodations within the hustle and bustle of the city center. It features an outdoor swimming pool and guests can enjoy meals from 4 of the in-house restaurants or have a drink at the bar. Free WiFi is available in all rooms. It is 1.1 mi to Suria KLCC and the Pteronas Twin Towers, while Aquaria KLCC and Pavilion Shopping Mall are 1.5 mi away. InterContinental Kuala Lumpur provides a free hourly shuttle service from Bintang Walk and Suria KLCC. Kuala Lumpur International Airport is 42 mi from the property. 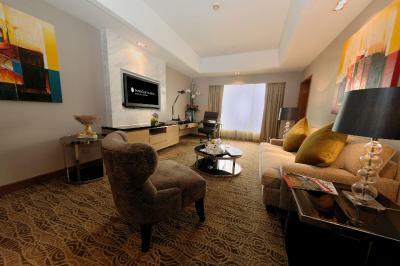 Modern rooms at InterContinental feature a flat-screen TV with cable channels. A mini-bar and tea/coffee maker are provided. Other amenities include a personal safe and work desk. InterContinental’s business center takes care of guests’ communication needs while guests can approach the 24-hour front desk for currency exchange, tour arrangements and ticketing services. Guests can also make use of the iPads available at the Concierge Lounge. Serena Brasserie serves a local and international buffet while light snacks and drinks can be enjoyed at OneSixFive. Other dining options are award-winning Tatsu Japanese Cuisine and Tao Chinese Cuisine. Bentley’s Pub also offers a relaxing ambiance for drinks. When would you like to stay at InterContinental Kuala Lumpur? This air-conditioned deluxe twin room is fitted with a flat-screen cable TV, an ergonomic work space and a safe. It features an private bathroom with shower facilities. The room offers a pillow menu upon request. This air-conditioned premier king room has a seating area fitted with a flat-screen cable TV, sofa and an ergonomic work space. The private bathroom include shower facilities, a hairdryer and free toiletries. The room offers a pillow menu upon request. This air-conditioned king room has a seating area fitted with a 50-inch flat-screen cable TV, sofa and an ergonomic work space. The private bathroom include shower facilities, a hairdryer and free toiletries. The room offers a pillow menu upon request. Includes butler service upon request and access to Club InterContinental. Please note that children below the age of 12 must be accompanied by an adult at all times at the Club InterContinental and are not permitted throughout the evening cocktail hours of 17:30 to 19:30. This spacious air-conditioned suite features a separate living room fitted with a 50-inch flat-screen cable TV, a sofa and an ergonomic work space. The private bathroom includes shower facilities, a hairdryer and free toiletries. This air-conditioned king room is fitted with a flat-screen TV, an iPod dock and a mini-bar. The ergonomic work space is equipped with a desk. The private bathroom includes a rain shower and free toiletries. This air-conditioned twin room is fitted with a flat-screen TV, an iPod dock and a mini-bar. The ergonomic work space is equipped with a desk. The private bathroom includes a rain shower and free toiletries. This air-conditioned twin room has a seating area fitted with a 50-inch flat-screen cable TV, sofa and an ergonomic work space. The private bathroom include shower facilities, a hairdryer and free toiletries. The room offers a pillow menu upon request. This air-conditioned premier twin room has a seating area fitted with a flat-screen cable TV, sofa and an ergonomic work space. The private bathroom include shower facilities, a hairdryer and free toiletries. The room offers a pillow menu upon request. This air-conditioned deluxe king room is fitted with a flat-screen cable TV, an ergonomic work space and a safe. It features an private bathroom with shower facilities. The room offers a pillow menu upon request. This air-conditioned deluxe room is fitted with a flat-screen cable TV, an ergonomic work space and a safe. It features an private bathroom with shower facilities. The room offers a pillow menu upon request. This spacious air-conditioned king suite features a separate living room fitted with a 50-inch flat-screen cable TV, a sofa and an ergonomic work space. The private bathroom includes shower facilities, a hairdryer and free toiletries. House Rules InterContinental Kuala Lumpur takes special requests – add in the next step! All children under 16 years are charged MYR 100 per night for extra beds. InterContinental Kuala Lumpur accepts these cards and reserves the right to temporarily hold an amount prior to arrival. Please note that guests are required to present the credit card used to secure booking upon check-in. Food selection at Club Intercontinental could be more varied each evening. Breakfasts were good. A guest laundry should be available, despite being a high end hotel. Many hotels around the world offer this (not necessarily Intercontinental). This is important in a high humidity city. Overall can’t really complain. The breakfas was excellent, though it was too clouded in the dinning unfortunately. The facility, inroom dinning were also great for me. I like those. Staff make you feel like a government official ! 5 star service ! Loved the Hotel. the rooms were great - Unfortunatly no view but luxurious none the less. Intercontinental staff make you feel like a celebrity. Great service! staff in club lounge were excellent with helpful tips on local restaurants and places to see etc. club lounge itself was very nice and relaxing with good choices of food and drinks. Very much enjoyed our stay, could not fault the hotel. Great staff and facilities. The booking site describes sauna as one of the activities available BUT the hotel does not have one! Kinda dissapointing. The hotel is clean and bed comfortable. I had a feeling that Intercontinental KL was build some time ago. Therefore, some facilities could be improved. The sink in our room worked not properly. The location is great. It’s just 5 mins from Petronas Towers. The red line metro station is next to the hotel. Our room was very big, light and clean. The bed was comfortable. The view from the room was just amazing. Breakfast was quite nice. The swimming pool was good but nothing special. However, the view from swimming pool was great (there are many skyscrapers around). The lobby has a nice bar with relaxing atmosphere. Overall, the hotel looks very solid. The staffs were friendly. The pool not many people. The cleanliness of the hotel is superb. Love th view from my room. We booked two rooms for 2 nights and it was a total nightmare. I have traveled all over the world, from 5-star resorts in Fiji to the most basic camping in Tibet so I dare say I have solid experience of what to expect / what is normal and what not in hospitality It already started at the checking-in. I requested a baby crib a week in advance for room 1, which wasn't there. Our baby desperately needed to nap and it took long; in the mean time, we let our baby (8 mnths) crawl on the floor, to discover there was an old slipper under the sofa. A quick look under the bed left us in complete horror: a.o. a used tissue, shampoo bottle, pen, someone's clipped nail (!!!) and lots of dust. Chocking hazards as well as very unhygienic. Upon further inspection, the floor appeared to be very dusty esp. near the walls. Housekeeping came and started to vacuum, however only next to bed and sofa only - I had to tell them multiple times to vacuum under the furniture as well. The manager at the reception promised to have another room thoroughly cleaned for us, which left us roomless (room 2 still wasn't ready) 2 hours after checking-in. We asked for another manager who was a bit more capable, and kept the initial room that had been cleaned under our supervision, to at least let the baby nap, and use a temporary room to have a place to rest, as offered by the 2nd manager. Out of curiosity we looked under the beds of the temporary room, to discover someone left a golden watch (at least better than a nail clipping...), some papers and pieces of plastic and a small USB-drive. SEVERE CHOCKING HAZARDS FOR A 8-MONTH OLD!!! The 2nd manager was very understanding and apologetic and offered us some free meals which was kind. It however did not make up for all the lost time and the frustration which really ruined our weekend. In addition: flooding toilet at restaurant, not repaired after 2 days, and stained napkins.